I wrote about the road many years ago. Here’s a little history. Some wonderful scenic country roads course through the Santa Cruz Mountains and Bear Gulch is one such road, about a mile south of Kings Mountain Road at Hwy 84. It bridges Skyline and 84, looking a lot like Old La Honda Road, but a bit steeper and straighter. Surrounded by redwoods and a canopy of madrone and tan oak, it passes by the California Water Service watershed to the north and Wunderlich County Park to the south. As with many roads in the area, it was built for logging redwoods in the mid-1800s, before being purchased by San Mateo County in 1899. As local cyclists know all too well, it’s closed to the public. Electronic gates block both ends to keep out all but occupants of about 25 residences near the road, tucked between watershed and parkland. The county spent $350,000 in public monies to help pave the road. In fact, ever since 1964, San Mateo County has done more than its share to help landowners build their dream homes on Bear Gulch Road. Residents got together to form an assessment district back in 1964 and over the years the county approved it and finally paved the road in November 1979 at a cost of $1.2 million, with residents chipping in about two-thirds of the cost. 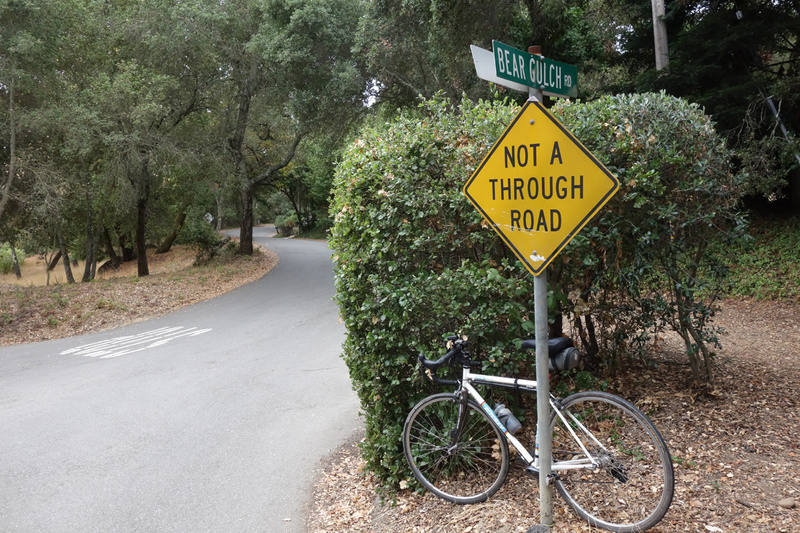 But like several roads up and down the Peninsula, it is partially owned by the county — and remains exclusively private. Before the road was closed, the county seemed eager to keep the area open to the public and provide a road for residents as well. It hired a Redwood City engineering firm to design a road 22 feet wide, broad enough for two fire trucks to safely pass one another. The public didn’t go for it. Who needed a road as wide as Highway 84? And besides, it was too costly. Residents continued to pursue the idea until 1974, when Martin Wunderlich made a generous offer to sell Wunderlich Ranch (now Wunderlich Park) bordering Bear Gulch Road at an extremely low price. If taxpayers didn’t want a huge road before, now, with this classy land addition, they would never approve. Bill Royer, chairman of the county board of supervisors at the time, and himself a former real estate developer, helped find a solution. The county said that the area was a headache, that it was impassable during winter rains and sometimes closed in the summer from fire danger. Residents complained about people shooting guns and raising a ruckus. Bear Gulch Road property owners met with county supervisors and public works director Sid Cantwell in 1976. County officials decided to abandon the road, then pave it at its current width of 12 to 16 feet, installing gates to keep the public out. Not only would the landowners have their paved road, it would be private. In return, the county got a bargain on a paved fire road and access to Wunderlich Park for park vehicles in exchange for turning it over to private use. A month after the road was paved, county supervisors held a public hearing to see if anybody objected to abandoning the road. Since the road width was not up to county standards [are they ever? ], the county supervisors declared it as unsafe for public use; the vote for abandonment was unanimous. Today the road is one of the best-maintained roads in the county, partly because it has so little traffic. Its surface is as smooth as the day it was paved [it was smooth back in 1989]. Even though it is the same width as nearby county roads, it has been declared unsafe, not just for cars but for bicycles, horses and pedestrians. This was stated in the road abandonment document, dated Nov. 14, 1978, said. However, a provision was made for allowing a recreation path next to the road, not that we’ll ever see that happen. Thanks to Steve Lubin for providing the document. This entry was posted on September 21, 2014 at 2:02 pm and is filed under History. You can follow any responses to this entry through the RSS 2.0 feed. You can leave a response, or trackback from your own site. Another perfect surface off limits rd is Frenchman’s Creek rd x El Granada-hwy 1 , above the private property signs also. This rd accesses Scarpers Peak, which has the FAA -SF Airport towers on top. If Frenchman’s Creek rd was in the mix for cyclists, it would provide a N of hwy 92 route from sea level to Pilarcitos Reservoir and on to Fifield -Cahill trail,eventually connecting w Sawyer Camp tr via 20+ ft wide fire roads.